Cheap Eats in London: Mamuska! I almost died when I went to Mamuska! As someone who suffers from ‘eyes bigger than their stomach’ and has a weakness for ‘cheap eats’, especially in London, my visit here could have ended badly. Thankfully, I was with Jamie Smiley from Runbreeze and he kept me on the straight and narrow with his restrained recommendations. This Polish cafe is situated within the hustle and bustle of the Elephant & Castle Shopping Centre. Having a Polish wife, he was the best person for recommendations and without him, I would have most definitely eaten more than I could safely handle. From L to R: Polish pate, potato pancakes with mushroom sauce and pierogi (dumplings). I had the classic minced pork Pierogi, plump and succulent and with a thick creamy dip. My gosh, I love these so much. Whoever comes with me next, I’m sorry, no sharing. 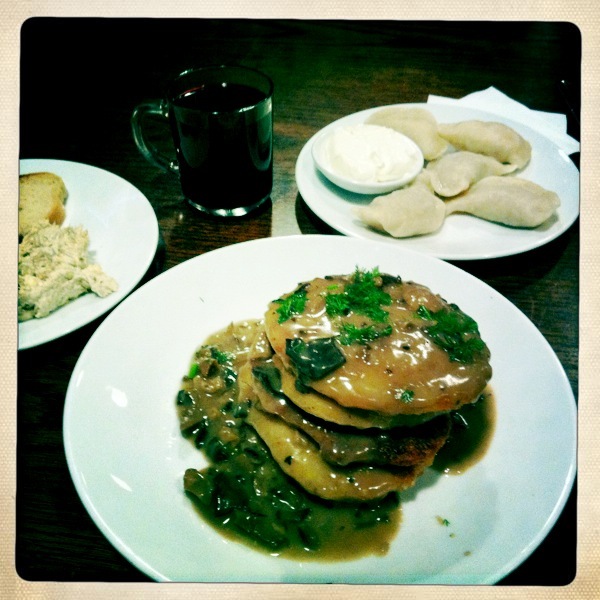 I also had the Polish pate (smalec z ogórkiem kiszonym i chlebem) and the pancakes (placki ziemniaczane). Four arrive on your plate and it’s impressive if you manage to eat them all – they’re heavy and potato-y and they nearly killed me! I tried mine with the mushroom sauce which I highly recommend but these also come served with pork goulash, beef stroganoff, or sour cream and sugar. I also opted for the Beetroot broth. Personally, I’m not a fan of beetroot and I chose it more out of curiosity, but it didn’t go down too badly. Just writing about this is making me hungry. And there are so many more dishes I need to try. Who will come with me? Visit www.mamuska.net for the menu & opening times. What to wear: Come in trainers, in a suit – anything goes. Best for: Filling, hearty food. Perfect for winter. Best bit: The low prices mean that you can try many dishes.